The Armenian EyeCare Project is pleased to invite ophthalmologists, neonatologists and other medical professionals to attend the AECP-CHLA 16th International Conference on Ophthalmology, Neonatology and Endocrinology on September 24 – 26, 2018 in Yerevan, Armenia. This will be a truly international congress that will gather prominent experts in various fields of ophthalmology, neonatology and endocrinology from different countries. The participants, who will gather at the Ani Plaza Hotel, will be professionals from the United States, Europe, CIS countries, Caucasus, Central Asia and the Middle East. 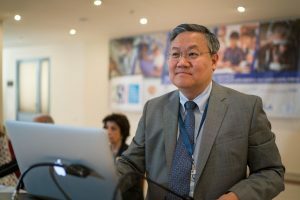 Dr. Thomas Lee, Director of the Vision Center at Children’s Hospital Los Angeles, speaks at the 2017 International Ophthalmology Conference in Yerevan, Armenia. 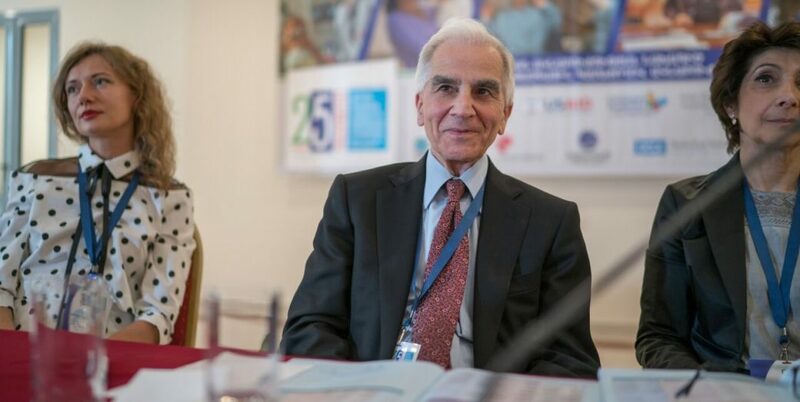 Staff from world-renowned institutions such as Children’s Hospital Los Angeles; Jules Stein Eye Institute; University of California, Los Angeles (UCLA); University of California, Irvine (UCI); Great Ormond Street Hospital for Children and Moorfields Eye Hospital will present and be available for questions and answers. The Armenian EyeCare Project (AECP) together with Children’s Hospital Los Angeles (CHLA), World Diabetes Foundation, Eye Samaritans International, United States Agency for International Development (USAID), Armenian Association of Neonatal Medicine, Armenian Association of Ophthalmologists and Armenian Association of Pediatric Endocrinologists have put together a compelling agenda for pediatric and general ophthalmologists, neonatologists and endocrinologists with an emphasis on eye disease. The conference will act as an impressive platform to share knowledge and experience in various areas and present advancements and innovative approaches in the healthcare industry. Its goal is to share medical knowledge as well as learn from advances in other countries. 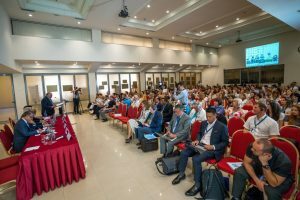 The 2017 International Ophthalmology Conference in Yerevan, Armenia. Day One will begin with a plenary session on the current projects implemented by key partners that leverage new cloud-based technologies in healthcare, e.g. systems to manage retinopathy of prematurity, artificial intelligence (AI) for diabetic retinopathy screening, and health data management. The afternoon will be followed by two concurrent sessions: pediatric ophthalmology (with an emphasis on retinopathy of prematurity and school vision screening) and endocrinology (with an emphasis on pediatric Type 1/Type 2 diabetes management, metabolic syndrome and obesity). Day Two will include concurrent sessions on general ophthalmology and neonatology. Among topics covered at General Ophthalmology will be Retina and Diabetic Retinopathy, Glaucoma, Cataract-Keratoplastics, Neuro-orbital and Refractive Surgery. The Neonatology session, among other issues, will reflect on non-invasive ventilation nutrition and new approaches in care for premature infants. On this day, participants will have the opportunity to visit the AECP Center of Excellence for the Prevention of Childhood Blindness in Yerevan, observe new approaches to infant care training on simulation mannequins and participate in other educational workshops. 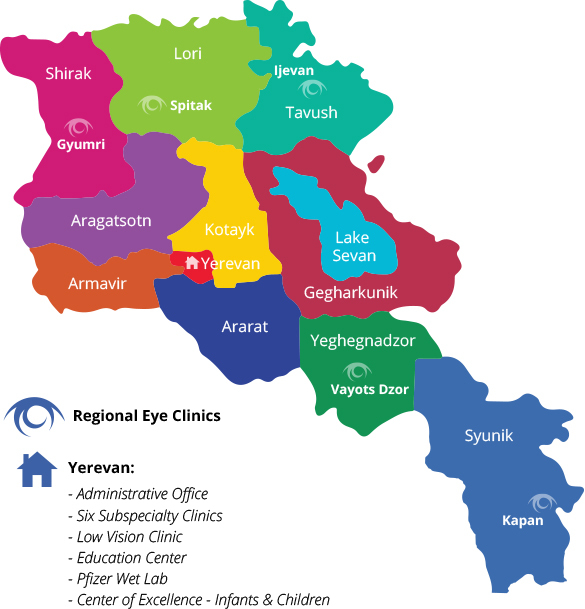 Dr. Anna Hovakimyan, Chief of the Corneal-Uveitis Clinic in Armenia, speaks of her experiences. 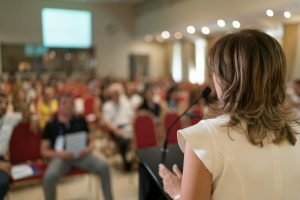 Talks will encompass new research and best practices in specific areas, panel discussions, and question-and-answer sessions. Apart from professional ophthalmologists, neonatologists, endocrinologists and nursing counterparts, this conference will be of interest to healthcare managers and health policy makers. If you are interested in attending the conference, please confirm your participation by August 15 at aecp@aecp.am or by registering here. If you would like to give a presentation, please send along an abstract by August 1. A group of reviewers will select abstracts for inclusion in the conference publication.